Xiaomi Redmi Note 6 Pro has similar to Design to Redmi Note 5 Pro. 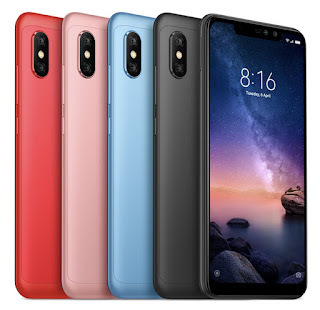 It has a 6.26-inch Full HD+ resolution with a 19:9, aspect ratio powered by Qualcomm Snapdragon 636 processor with 4GB of RAM and 64GB internal storage which is further expandable with MicroSD card. On Camera, it has a 12MP + 5MP Dual Rear camera and a 20MP + 2MP dual-camera with an aperture of f/2.0, portrait mode support, and AI face unlock. Packed with a 4000mAh battery.